Sanjina’s journey began at Kathmandu University, Nepal where she completed a Bachelor of Science with an Honours Project on monsoon variability analysis in Nepal from 1979 to 2008. In 2011 Sanjina’s life changed when she received an ICE WaRM International Scholarship to study a Master of Water Resources Management at the University of Adelaide, for which she received a South Australia Governor’s International Students’ Highly Commended Award for Postgraduate Academic Excellence. 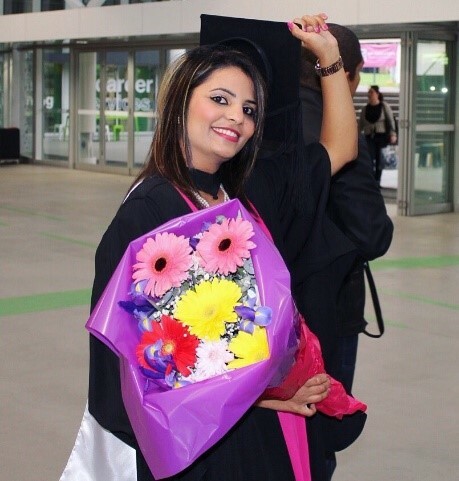 “After completing a Master’s I was worked as a Research Assistant at the School of Biological Sciences at the University of Adelaide before I was offered PhD in the same school,” Sanjina explains. Sanjina went on to complete a PhD on Responses to aquatic ecosystem metabolism to managed inundation of a regulated dryland river floodplain then worked as a Postdoctoral Research Fellow in the School of Biological Sciences at the University of Adelaide. Earlier this year, Sanjina was excited to reunite with her lecturer, Sabita Aryal from Kathmandu University, who attended the ICIMOD-ICE WaRM Himalayan University Consortium Asia-Pacific Water Leadership Programme in Adelaide. “I would not be where I am today without the ICE WaRM scholarship,” says Sanjina. Sanjina has since and been appointed to a Postdoctoral Research Fellowship at Aarhus University in Denmark and moved to Denmark in May to pursue her career as a Marine Scientist. The International Scholarship Programme was made possible by ICE WaRM’s Federal funding through the Water Resources Management (WaRM) Trust which was established to promote the development and sharing of knowledge and skills in water resources management. Unfortunately, federal funding of the Trust is now exhausted. The Trust receives and allocates funding to various initiatives including facilitating national and international links between water resources experts and decision makers, and developing and offering scholarship programmes in water resources management to individuals and institutions. To find out more about how you can contribute towards funding the WaRM Trust and support students like Sanjina from developing countries, please visit our website or contact us.